Is remote work only for a select few? What demographic data we have on the phenomenon from the Telework Research Network has found existing telecommuters tend to be older, well paid and highly educated professionals. Meanwhile, a recent study suggested that while remote work boosted productivity on creative tasks, it generally reduced it for boring, rote activities. These findings could suggest that remote work is best suited for senior-level folks and the highly educated – the designers, programmers and content producers that many of us generally picture when asked to imagine laptop-toting virtual workers. But outsides of cafes in places like San Francisco, there’s a whole other side of the remote work revolution going on, one that’s focused on lower skilled employees like customer service agents who are seeing their place of work move from call centers to home offices and living rooms. Take Hertz’s “Journey to Home” program as an example. The rental car company originally housed its customer service agents in an Oklahoma City call center, but over the last few years has been transitioning to have nearly half of its agents working out of their homes. Why? “From a disaster recovery perspective, if you put all your eggs in one basket, especially when that basket sits in the center of the United States where a lot of natural disasters can happen, you put yourself at risk for major interruptions to the business, so we decided that it would be good to have another center of gravity,” Joe Eckroth, Hertz’s CIO, told GigaOM. Hertz’s experience shows that less glamorous remote initiatives can work, but Eckroth stresses that success requires careful thought and planning. “We took some of our best and brightest people and we made it their sole mission to make it work,” he says. “It wasn’t a part-time job. It wasn’t something on the side.” Hertz’s experience shows getting highly motivated, highly communicative managers is key, but so is getting the right employees, and they aren’t necessarily the same people who would thrive in a traditional call center. “Anybody can try to work from home, but it takes a certain set of disciplines. It takes a different mentality for somebody to stay motivated, to be undistracted and succeed at home. If you just took the average guy in the call center and sent them home, there would probably be a fairly high failure rate,” Eckroth says, noting that in fact some of the Oklahoma City call center’s star employees tried remote work and subsequently requested to return “to the box,” as Eckroth refers to it. Should more companies consider letting their less highly skilled employees skip the drive in to the office and just stay home? Image courtesy of Flickr user mrkathika. Question- Do you think this increased productivity will last long term? I feel like in the short term the ability to work at home for this kind of function is good but as time goes on people will find ways to stretch the rules and get distracted. How long has the Hertz program been going on for? 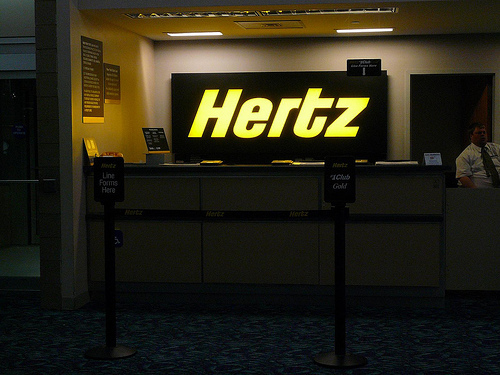 How long has the Hertz program been operating? I can imagine in the short run the idea is great since people like the freedom, but do they maintain better productivity and morale long term? I have a feeling that in the long term people will find ways to start finding ways to stretch rules and become distracted at home. I know this strategy saves companies a lot of money since they don’t need a centralized facility but will productivity drop off?